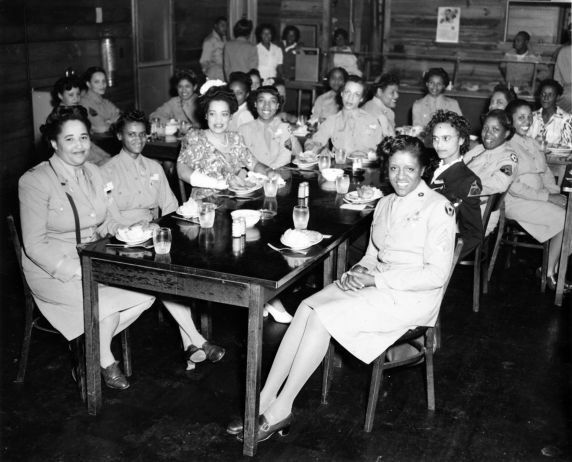 Local 6 member Helen Murphy, left of center, dines with African American members of the Women’s Army Corps during a visit to Fort Knox, Tennessee. Ms. Murphy was part of a delegation of two hundred UAW members from Michigan, Illinois, Kentucky, Missouri, Ohio, Indiana and Wisconsin who spent three days at Fort Knox in order to to experience army life, learn how the the goods they make are used, and to have a chance to meet with soldiers to talk over the technical problems of production. The trip was sponsored by the CIO and the UAW War Policy Department.